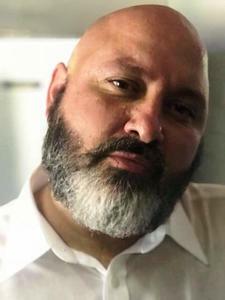 Mr. Dale Mitchell Greenert, 44, departed this earth onto his next journey on February 26, 2019 in Fruitport Township, MI. Dale was born to Kathryn (Stromberg) and Donald E. Greenert on February 14, 1975 in Muskegon, MI. He grew up in the East Broadway area and attended Fruitport Community Schools. He followed in his father’s footsteps and worked at Knoll, Inc for 19 years. Dale enjoyed riding his Harley-Davidson motorcycles, hosting cookouts in his backyard, playing Euchre, quoting funny movie lines and especially listening to music; he loved all kinds from Waylon Jennings to Pantera. Dale also had the ability to make you laugh, sometimes without having to say a word. He was a simple man, loyal, loving, and giving and would help anyone in need. To know him was to love him, and to know him, was a blessing. Dale is survived by his 2 children, Mason, 10 along with his mother Rachelle Wildey; and Grace, 3, along with her mother Rebecca Parm; nephews Jeffrey, Zachary, Jayson, and many aunts, uncles and cousins. He is also survived by a tight knit circle of friends. He was preceded in death by his Mother Kathryn (“Kathy”), Father Donald E. (“Don”), Brother Donald M. (“Donnie”), and Brother Michael Melanowski; Grandparents Marvin and Virginia Stromberg, and Edwin and Ida Greenert. There will be a celebration of Dale’s life held at the Fruitport Eagles #3666 on March 24, 2019 from 1-5pm. All of those whose life Dale touched are welcomed to attend. In lieu of flowers, please consider donating to the GoFundMe fundraising campaign entitled Children of Dale Greenert and Final Expenses.